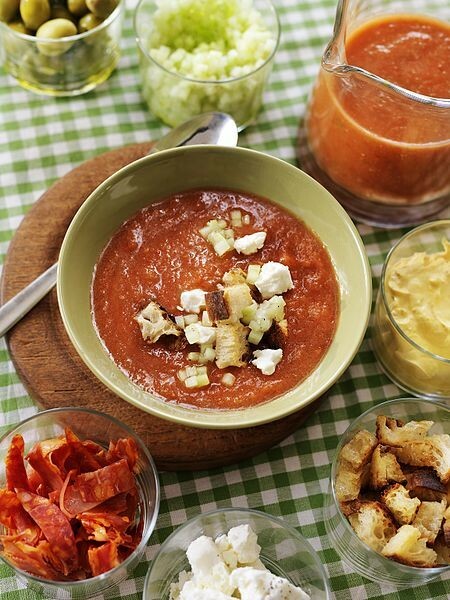 Gazpacho is a cool, refreshing and flavourful start to a meal on a hot summer day. You can eat gazpacho from a soup bowl, or drink it from a glass. Either way, it is tasty, refreshing and very healthy, since it is made from nothing but fresh vegetables and a bit of oil and vinegar. During the hot weather, do what the Spaniards do - Make a batch of gazpacho and keep it in a glass pitcher in the refrigerator for whenever you need a cool drink. Soak the bread in a small amount (few tablespoons) of water. Gently remove and “squeeze” dry. Tip: The easiest way to peel tomatoes is to boil water in a medium saucepan. As soon as water boils, turn off heat and place the tomatoes into the hot water for 1 minute. Carefully remove hot tomatoes. The skin will rub off easily.